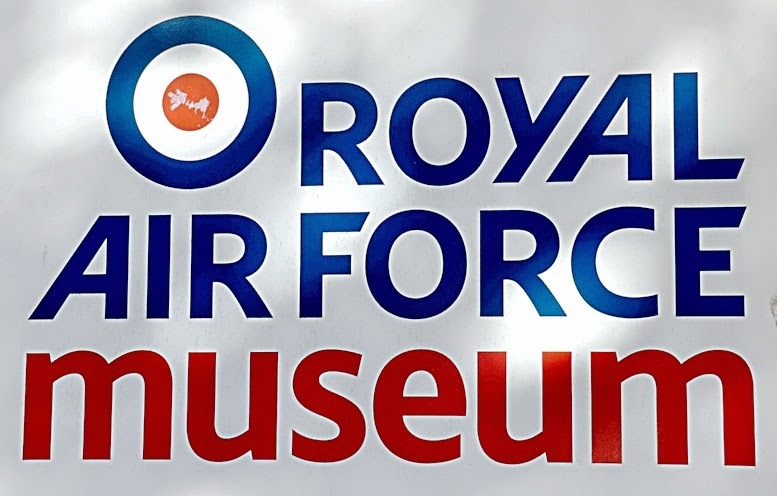 You’ve only got this week to get along to the Royal Air Force Museum in London, to see a fascinating exhibition. 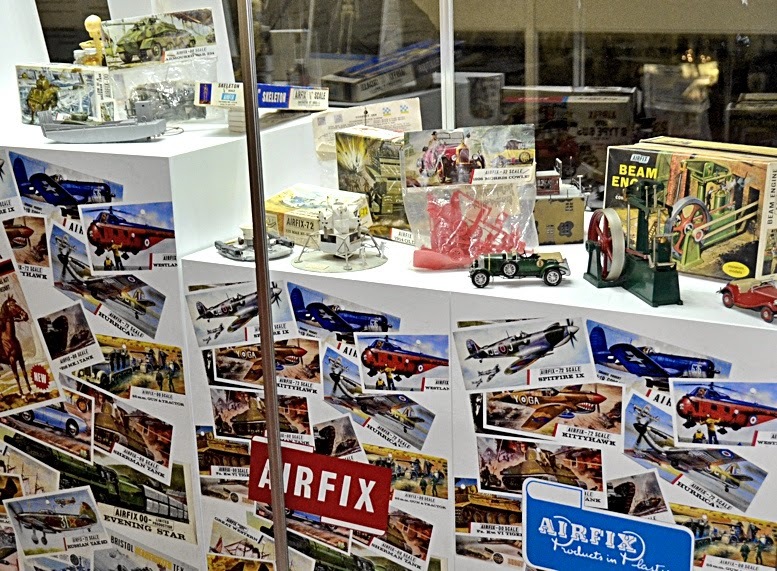 It closes at the end of May, so for a close look at Airfix kit history, it’s the place to be. 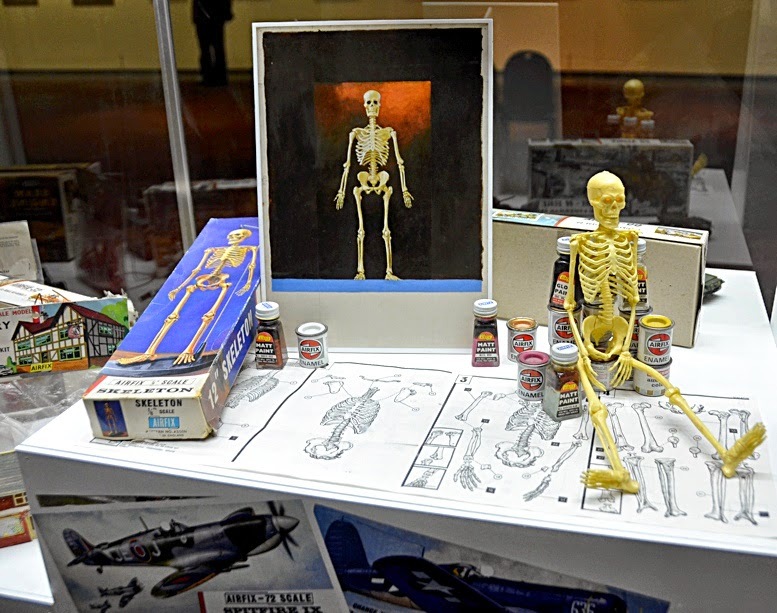 Mat Irvine reports: The show consists of two displays, one of original box-art, primarily by noted artist Roy Cross, then two large cabinets that hold examples of models, boxes, paints, and other artifacts. 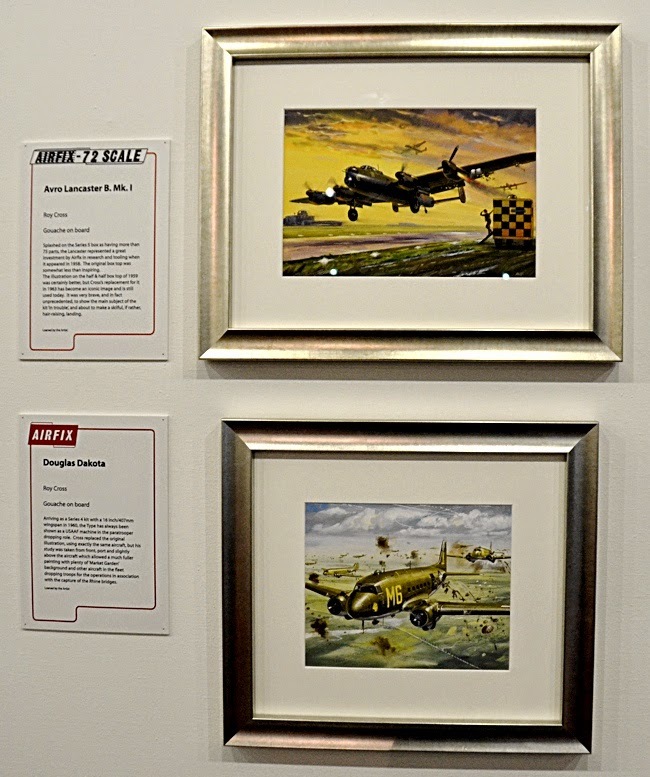 The show is not just about model aircraft, instead covering the whole range of Airfix subjects. Possibly the most interesting part is that the models shown are not professionally built as you might expect - actually, they are constructed by amateur model makers. 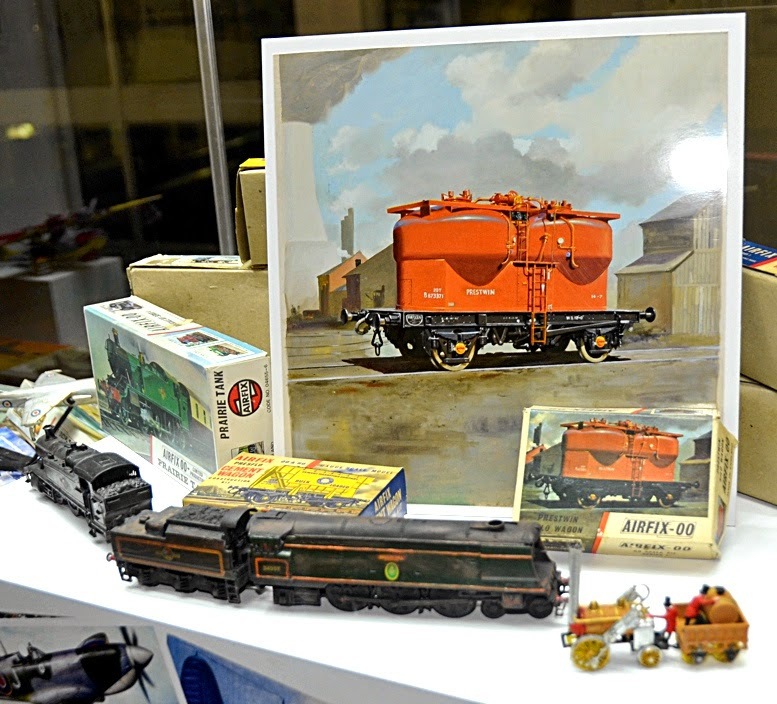 Models in the show include aircraft, figures, rail rolling stock, ships, cars old and new, and some educational models, such as the Beam Engine. 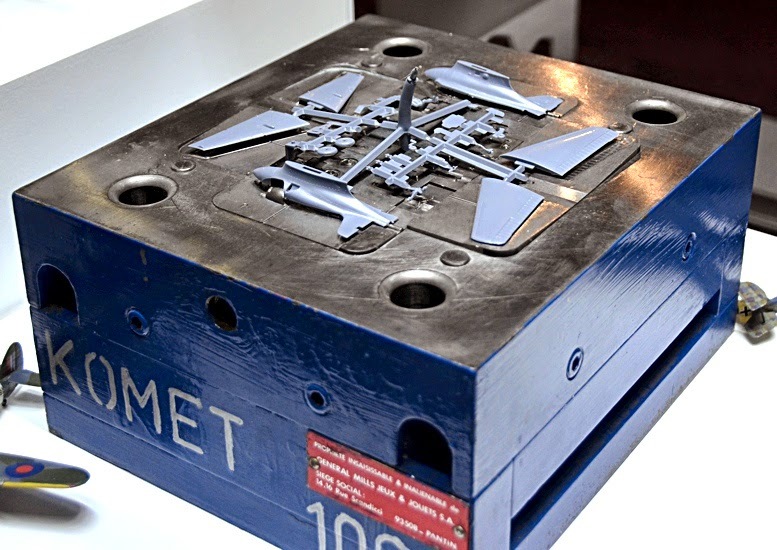 An injection-moulding unit (below) is also on display, perhaps the only one that would fit inside a cabinet, itself strong enough to take the weight of the solid-steel mould, probably 50 kg (110 lb) or more. Here a Messerschmitt Me 163 Komet moulding is laid on top. 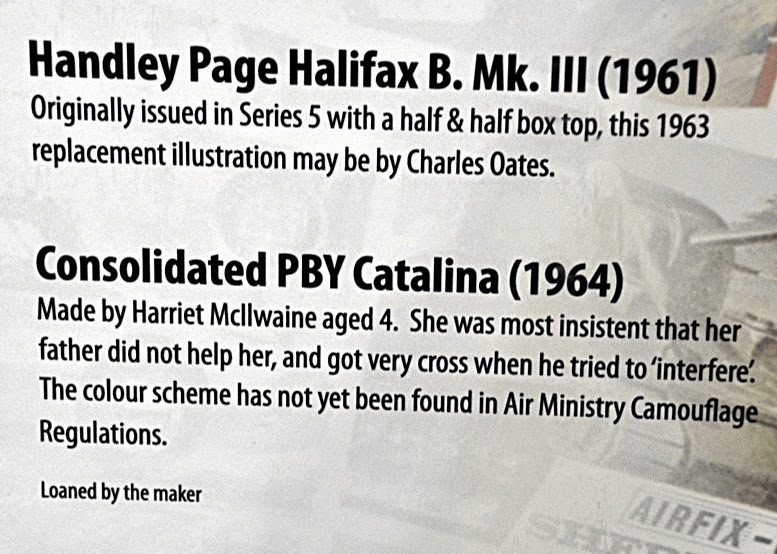 Airfix is really all about ‘modellers of all ages’ the youngest in the show being listed as just four years old. 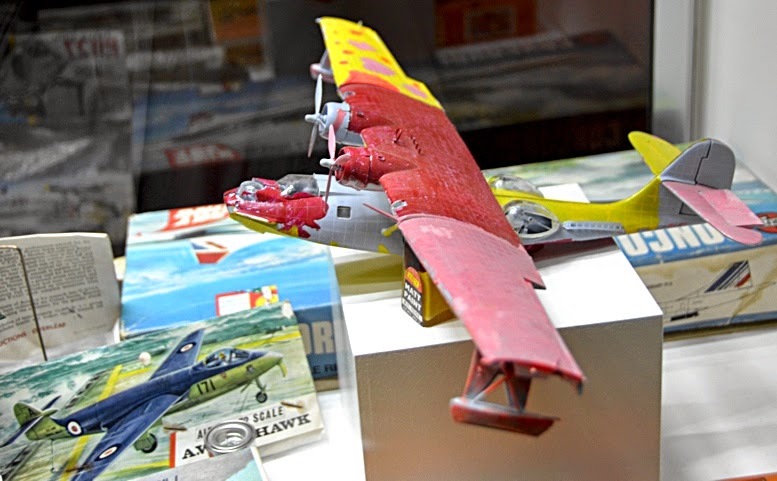 Harriet McIlwaine insisted that her father had not helped her assemble the PBY Catalina, and she got very cross when he tried to interfere with her paint scheme for it (below). 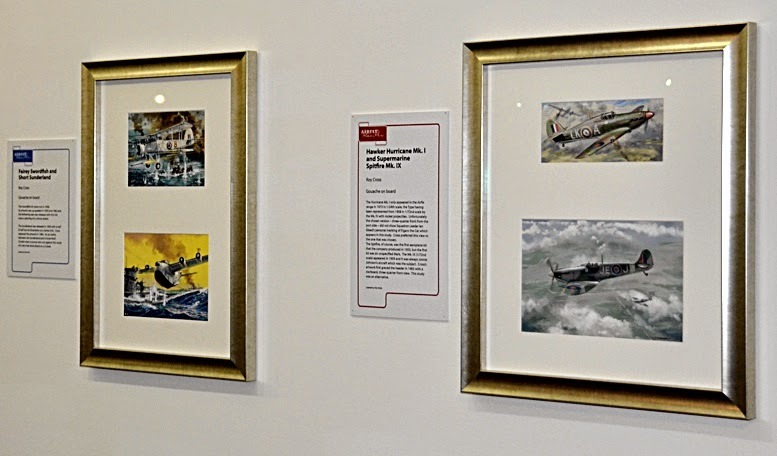 Closer view of two classic Roy Cross paintings, the Avro Lancaster and Douglas Dakota. 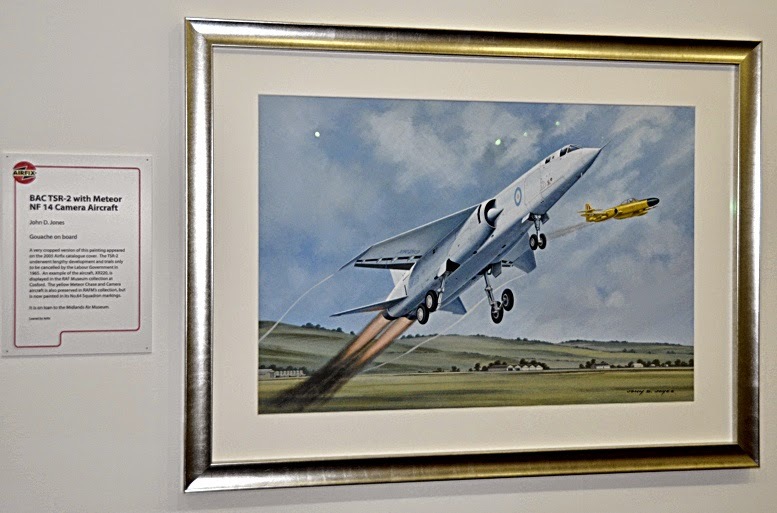 A BAC TSR-2 on afterburner climb with Meteor jet just behind, by John D. Jones. 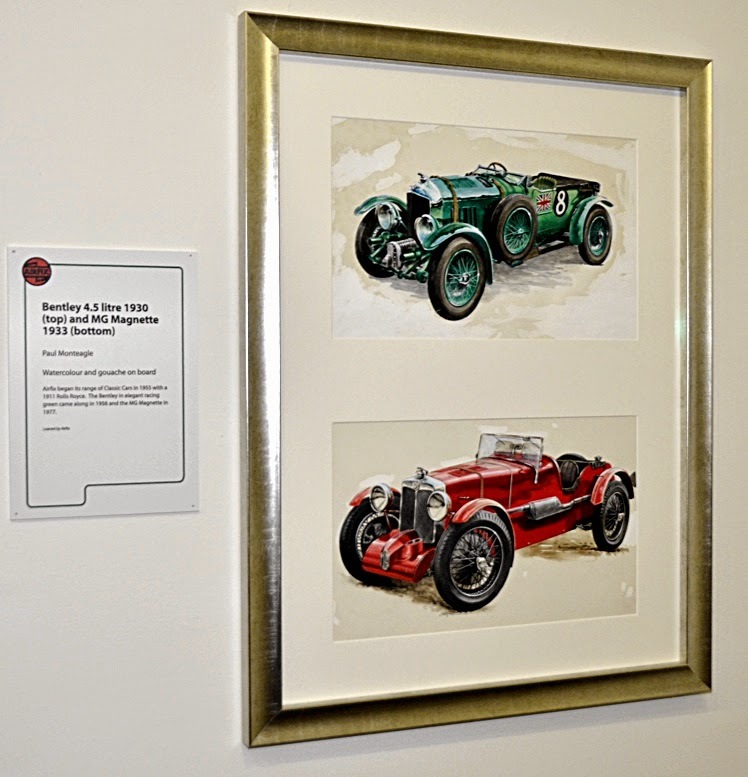 Two cars, a Bentley and MG, painted by Paul Monteagle. 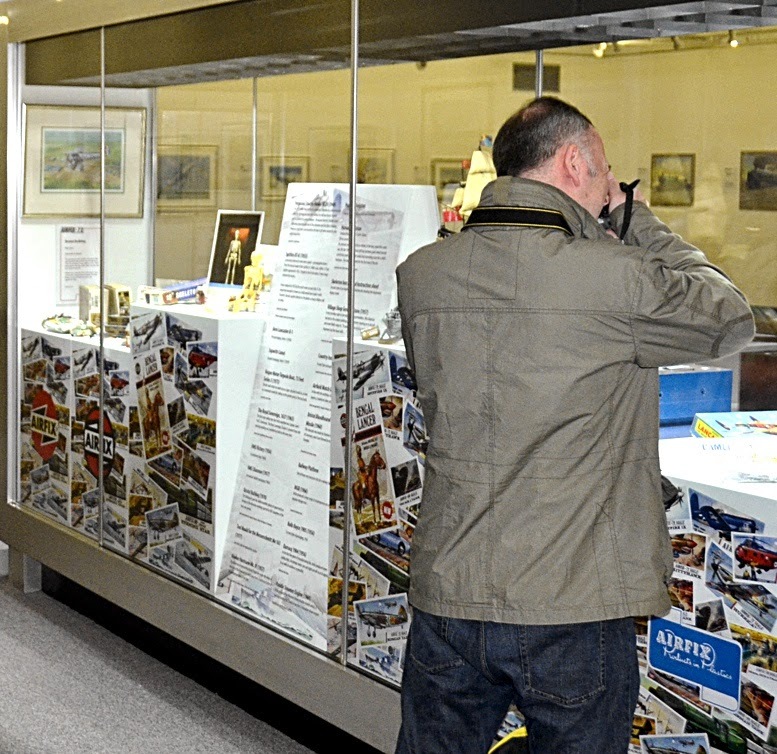 The display cabinets are packed with Airfix goodness. 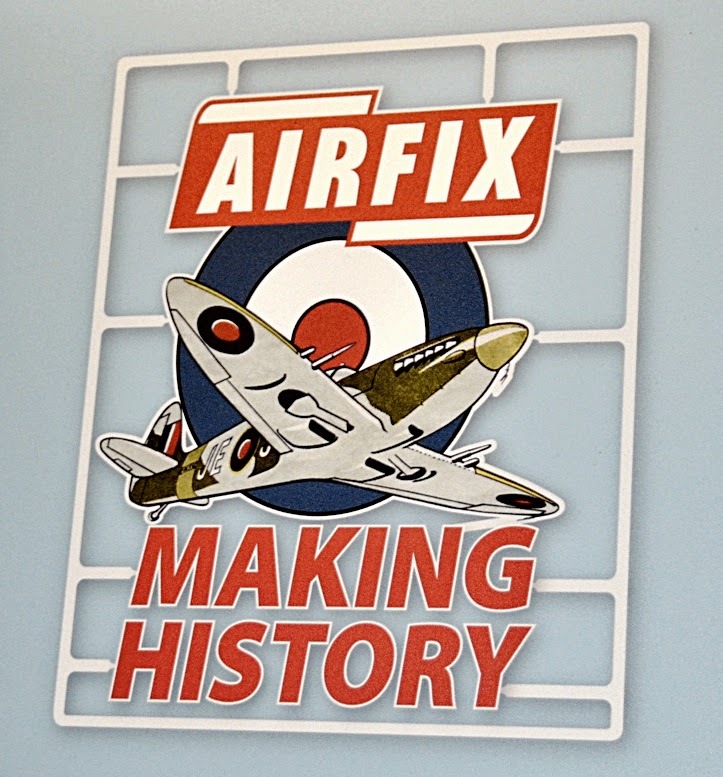 Note the changing Airfix logos through the years. 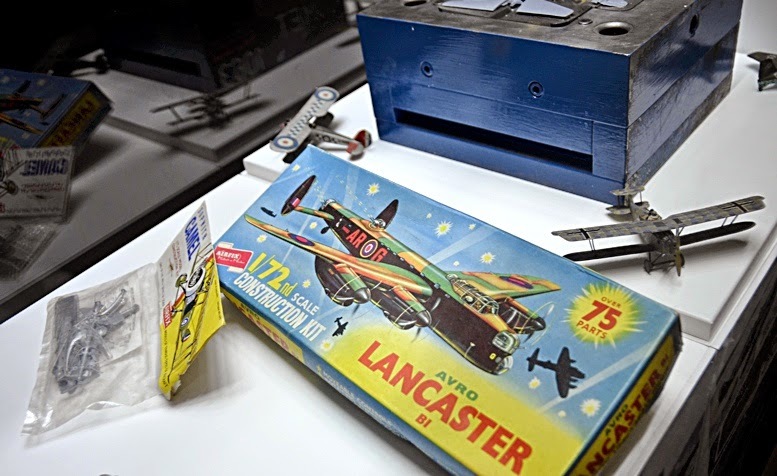 The first Lancaster box, with 'over 75 parts.' The earlier Airfix Ferguson tractor is listed as being present, but has been removed. Airfix has produced a very wide range of subject matter with its kits, Revell being arguably the only other kit company that matches this. 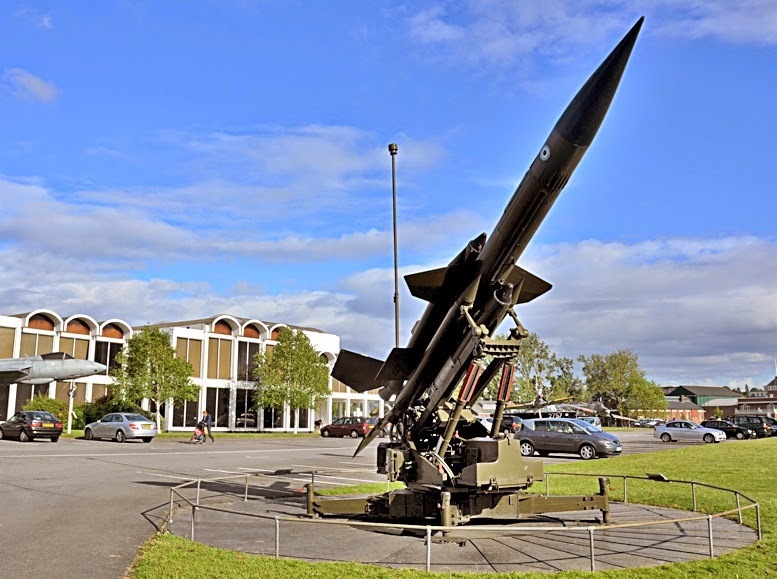 In the front row below is a Bloodhound missile, the full-size version of which greets you at the Museum gate. Another kit with a difference, the human skeleton. 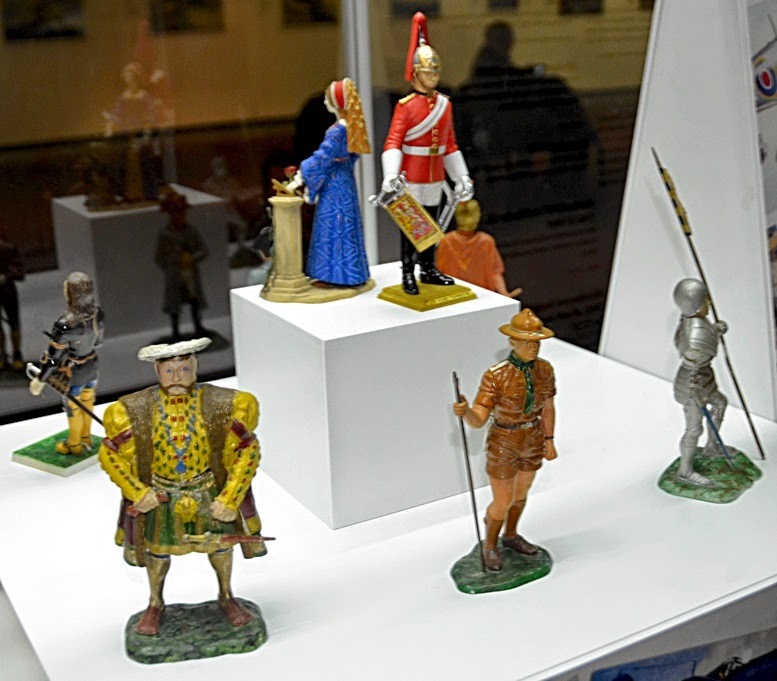 Larger-scale figures on display include the very rare Boy Scout, centre front. 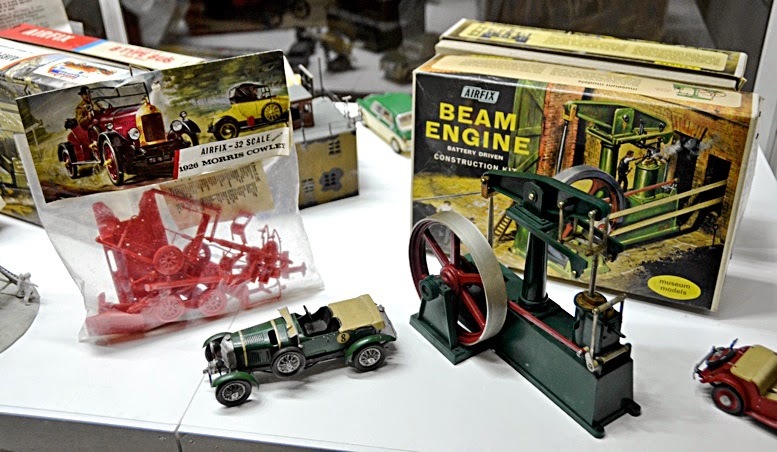 More 1:32 scale cars, and the Beam Engine. Sign showing details of the Catalina builder and painter, Harriet McIlwaine, aged four when she built the kit. One piece of box-art not on the wall. Perhaps a twin-hopper silo truck is not as exciting as a Lancaster! Even so, the illustration is highly attractive. 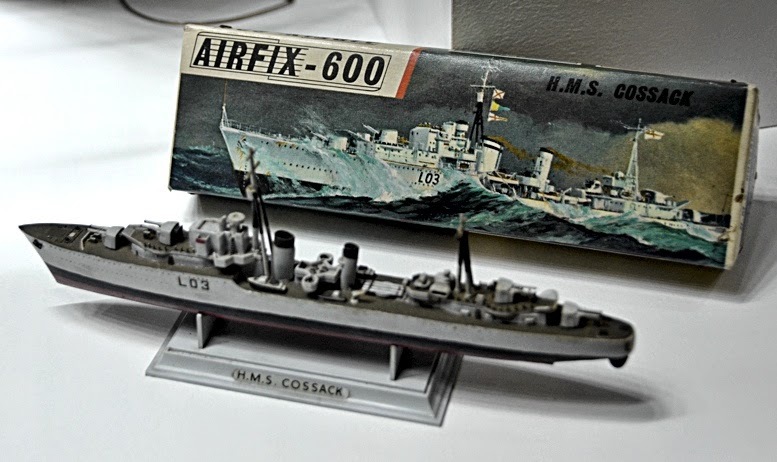 HMS Cossack, first kit in the 1:600 scale Airfix modern ships range. More credit for who built what. This panel mainly concerns the larger-scale figures on the left. RAF Museum building and on guard in front of it, a 1960s-era Bloodhound anti-aircraft missile. Sign at the RAF Museum entrance. The place makes a full day-trip for any air fan, let alone if there's an Airfix exhibition on show too. 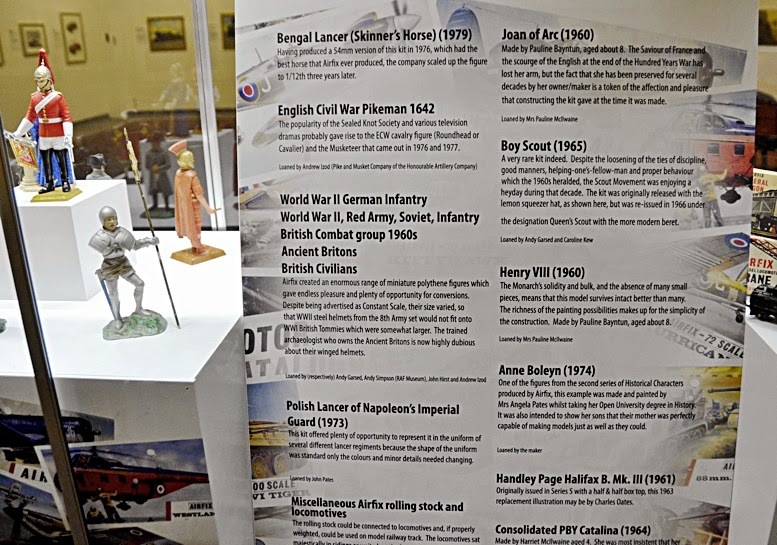 Click here for more info on the Airfix 'Making History' Exhibition.